Serving all of Maryland, including Baltimore, Frederick, Rockville, Columbia, Bethesda, Gaithersburg, Ellicott City, Silver Spring, Potomac, Chevy Chase, and many more. Rain, foliage and heavy snow storms wreak havoc on Maryland home rain gutters every year. That’s why Maryland residents in search of gutter guards turn to Gutter Helmet®. 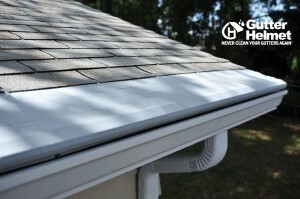 Gutter Helmet® is America’s most trusted patented gutter protection system that prevents gutter clogging. At Gutter Helmet® we back this promise with a 100% consumer guarantee that you will never have to clean your gutters again. When your gutters remain free flowing, you are protected from the water hazards that can damage your gutters year round – heavy rain, snow and ice. And you never have to climb a ladder again. Don’t let your gutters overflow or clog ever again. Call the gutter protection professionals from Gutter Helmet® of Maryland. We have been protecting Maryland gutters for over 35 years. After thousands of gutter guard installations, we’re the clear choice in regard to gutter guard systems for Maryland residents. Gutter Helmet® of Maryland serves all of Maryland, including Baltimore, Aberdeen, Westminster, Annapolis, Rockville, Bowie, La Plata, Potomac, Bethesda, Ellicott City and Lexington Park.